Dock&Go - Maneuvering a Yacht has Become a Game! Dock&Go – Maneuvering a Yacht has Become a Game! Thanks to French yacht builder Beneteau revolutionary innovative system maneuvering a yacht now looks like playing a game with a joystick. Their intuitive docking system is called Dock & Go. It allows absolute control in moving 90° to port or starboard, forward, astern and even turning on the spot; enabling safe maneuver in limited space areas and in cases of complex berthing situations. The heart of Dock & Go concept is coupling between the synchronized bowthruster and 360° pivoting saildrive. Going astern is achieved by pivoting the saildrive of 180° without any loss of power, while the pivoting is carried out in a half of second by electric motor. The same way both the stern and the bow could be controlled by Dock & Go system in case of strong side winds, allowing the skipper to avoid collision with other boats and obstacles in limited space areas as well as the mooring lines and other hardly visible underwater lines. During the entire maneuver the helm is blocked while the control over bowthruster and pivoting saildrive is provided by the intuitive joystick mounted at the helmsman position; while the synchronization is provided by the computer equipped with AI micro processor as the very heart of the system. 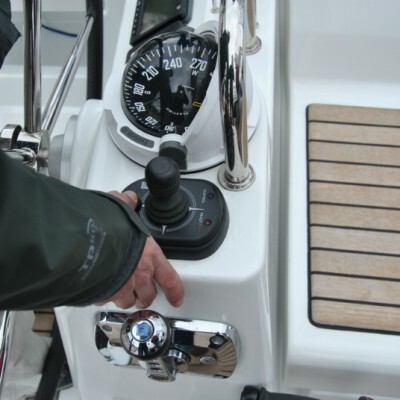 The Dock & Go system is offered as an option on many Beneteau sailing yacht models fitted with Yanmar 75 HP SD engines, including the Oceanis 46 and Oceanis 50 as well as the new Sense 50. However, the use of Dock & Go is a bit controversial in terms of charter business. On one hand Dock & Go is useful because it significantly increases the maneuverability of sailing yachts preventing the yacht from being damaged. On the other hand, there are two electric motors – one powering bowthruster and the other powering the pivoting system; so extra care and maintenance should be kept in mind because charter customers very often take such devices for granted and are not careful enough when using them. However, this revolutionary and rather simple system by Beneteau already found its place on the favorite devices list by many sailing enthusiasts and professionals.